Heart sisters Ann and Nancy Wilson will publish their autobiography, “Kicking And Dreaming,” on September 18. The story of Heart is a story of heart and soul and rock ’n’ roll. 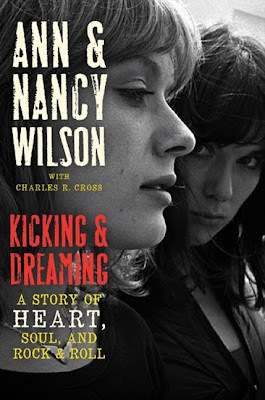 Since finding their love of music and performing as teenagers in Seattle, Washington, sisters Ann and Nancy Wilson have been part of the American rock music landscape. From 70s classics like “Magic Man” and “Barracuda” to chart- topping 80s ballads like “Alone,” and all the way to their forthcoming 2012 album, “Fanatic,” Heart has been thrilling their fans and producing hit after hit. With the help of bestselling music biographer Charles R. Cross, the Wilsons recount a journey that has taken them from a gypsy-like life as the children of a globe-trotting Marine to the frozen back roads of Vancouver, BC, where they got their start as a band, to the pinnacle of success—and sometimes excess. Readers will learn the truth about the relationship that inspired ‘Magic Man’ and ‘Crazy On You’, the turmoil of inter-band romances gone awry, the reality of life on the road as single women and then as mothers of small children, and the thrill of performing with, and in some cases partying with, the likes of the Rolling Stones, Van Halen, Def Leppard and other rock legends. It has not always been an easy path. Ann struggled with and triumphed over a childhood stutter, body image, and alcoholism; Nancy suffered the pain and disappointment of fertility issues and a failed marriage but ultimately found love again and happiness as a mom. Through it all, the sisters drew from the strength of a family bond that trumps everything else, as told in this intimate, honest, and uniquely female take on the rock and roll life.